(StSlp: t. 1,016; 1. 198'11"; b. 33'10", dr. 13', s. 11 k.
Iroquois got underway from New York 19 January 1860 for duty in the Mediterranean. Her service eame at a time of political unrest in Europe, with the movement for Italian unification in its beginning stages. lroquois sailed for Palermo, Sicily, to protect American lives and property as Garibaldi began his campaign to drive French troops from the island. The Italian patriot came on board Iroquois 20 June 1860 and conferred with Comdr. Palmer. The ship operated in the Mediterranean into 1861, but the impending Civil War brought greater demands on the Navy and she was recalled. Arriving 15 June 1861 at New YoTk, she was immediately sent to the Caribbean to search out and destroy southern commerce raiders. At Martinique she found Sumter nnchored in the harbor. But the Confederate ship, under command of Semmes, with the ussistance of French authorities slipped out 23 November to resume attacks on Union shipping. Iroquou continued her ,patrol in the Caribbean. 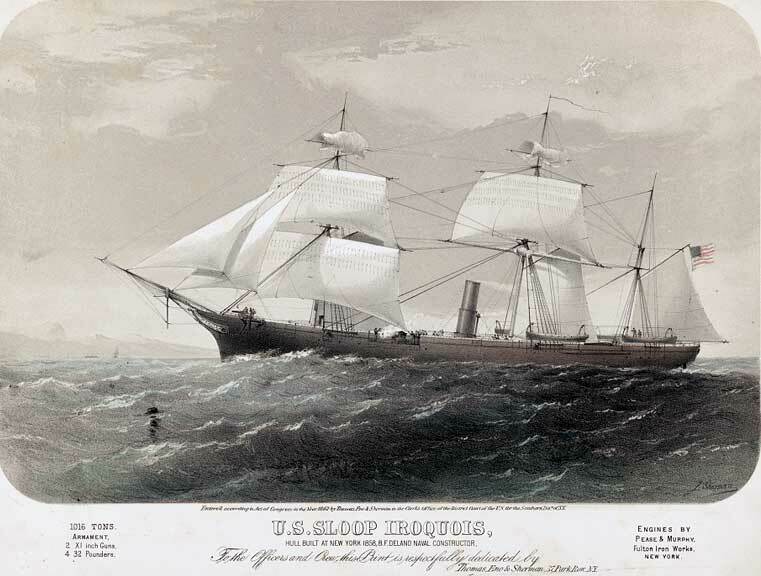 On 14 January 1862 she stopped British sloop Rinaldo. On board were Confederate ministers Mason and Slidell, captured earlier by Union ships but released; Comdr. Palmer allowed them to proceed under surveillance. Iroquois was sent later in 1862 to join Flag Offlcer Farragut at the mouth of the Mississippi, in preparation for his attack on New Orleans. Arriving o~ Ship Island 28 March, the ship moved to a position below Forts Jackson and St. Philip, guarding New Orleans, 16 April. Comdr. D. D. Porter's mortar boats then began a devastating bombardment, and by 24 April the ships were ready to attack. Iroquois moved abreast the torts as part of the 3d Division under Captain H. H. Bell and, after a spirited engagement, passed them and pressed on for the capture of New Orleans, the South's largest and wealthiest city and key to the Mississippi Valley. After the great victory Iroquois advanced up the rivet with Farragut, with the aim of eventually joining Flag Offlcer Foote, who was driving southward. A landing party was sent ashore at Baton Rouge 8 May 1862 and Comdr. Palmer received the surrender of the Louisiana capital that day. Iroquois, along with Oneida, also took possession of Natchez 13 May as the fleet moved steadily toward the Southern stronghold at Vicksburg. Within a week they were below the city and preparing to pass the formidable batteries. After periodic shelling Flag Offlcer Farragut, supported by the mortar boats, passed the Vicksburg batteries 28 June afteT a heavy exchange of gunBre. Iroquois survived the action virtually unscathed. With the rest of the fleet she met Flag Offlcer Davls and his Western Flotilla above Vicksburg. This was but the first step of Lincoln's order to "clear the river." Iroquois remained in the Vicksburg area until late July, helping in the bombardments and preparations for ex~peditions into the surrounding marshlands. In early September she again entered the Gulf of Mexico to take part in the strangling blockade of Southern commerce, but boiler trouble sent her north 21 September. She arrived New York 2 October and decommissioned 6 October 1862 for repairs. Iroquois recommissioned 8 January 1863, Comdr. Henry Roland in command, and got underway later that month to convoy monitor Weehawken to Newport News. Joining the North Atlantic Blockading Squadron off North Carolina, she captured blockade runner Merrimac 24 July and helped in the capture of Rate 12 days earlier. Aftter several more months on arduous blockade, she steamed to Baltimore for repairs, decommissioning 8 October 1863. The ship recommissioned 31 March 1864, Comdr. C. R. P. Rodgers in command. After serving briedy in the North Atlantic, Iroquois steamed to the Mediterranean to Proteet American commerce and. interests. She also took part in the giant search for the Confederate raider Shenandoah, flnally arriving Singapore in May 1865 after a long voyage around South America and across the Pacific. With the war over, she sailed in July for the United States, arriving New York 1 October 1865. She decommissioned there 6 October 1865. Upon recommissioning 7 January 1867, Comdr. Earl English in command, the veteran ship sailed 3 February for duty with the Asiatic Squadron. She was present at Osaka, Japan, when that port and neighboring Hiogo were opened to foreign commerce 1 January 1868, and she took part in the rescue operations following the overturning or Rear Admiral Henry H. Bell's boat in the harbor 11 January. Despite the best efforts of the ships present, the squadron commander and 11 others were drowned. During the local conflicts which engulfed the ports during January, Iroquois stood by to protect American interests, and carried the foreign ministers to Hiogo 1 February when they were expelled from Osaka. She remained on this critical duty with the Asiatic Squadron until returning to the United States in February 1870 She decommissioned at League Island, Pa., 23 April 1870. Iroquois Tecommissioned 23 August 1871 under Comdr. EI. A. Adams. She operated on the East Coast until 18 March 1872. She then 6ailed for another cruise with the Asiatic Fleet, making the long voyage via the Mediterranean, the Suez Canal, and the Indian Ocean. The ship remained off China and Japan until returning to San Francisco 1 July 1874. She again decommissioned for repairs 23 July 1874. Following a long period of inactivity Iroquois recommissioned 12 April 1882, ComdT. J. W. Sands in command. On Pnciiic station, she patrolled to South America, Hawaii, Australia, and Pacific islands protecting American interests and commerce. She took part in naval action in Panama in the spring of 1885, helping to land Marines to protect American commerce during the revolution. After 10 years of service on the Pacific Station, Iroquois arrived Mare Island 24 April 1892 and decommissioned there 12 May 1892. The ship was transferred to the Marine Hospital Service and served until she recommissioned 13 December 1898, Lt. Charles Pond in command. She cruised in the Pacific for 6 months before decommissioning at Honolulu 30 June 1899. Iroquoie was then transferred again to the Marine Hospital Service. Her name was changed to Ionie 30 November 1904. Her name was struck from the Navy List 26 August 1910.